Are you looking to build a social media contest that blows the roof off? Hosting a social media contest is by far the most attractive option for businesses because social media contests allow you to offer something unique to all of your online followers and attract new eyes to your social profiles. Also, chances are that all of your social media followers are not also clients so running a contest is a quick and effective way to turn those followers into leads and sales. According to Social Media Explorer businesses see a 34 perfect increase in their fans from social media contests. Since you’re ready to build your social media contest, use these 10 templates to help you turn your vision into reality! 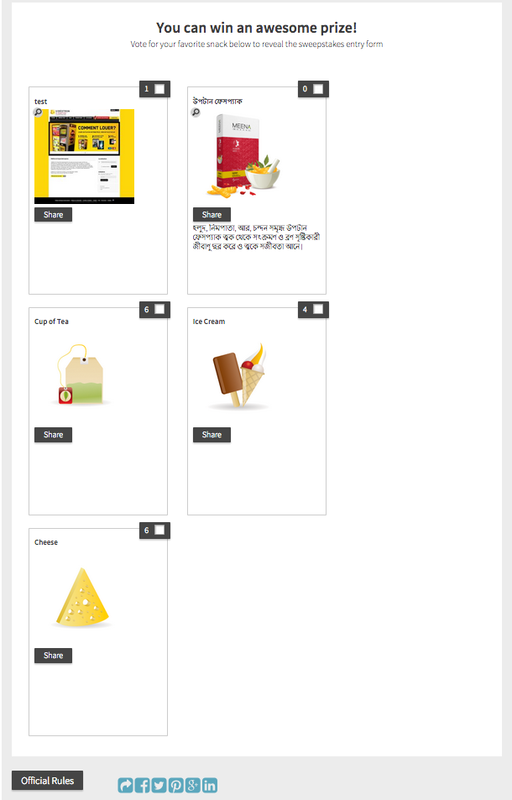 You can use our Photo Vote Contest template in a couple of ways. You can ask your followers to upload their own photos and then ask your community to choose their favorite, or you can upload your own photos and then allow your followers to vote on their favorite photo. Once followers upload their photos, encourage them to share the contest with their friends so they can receive more votes on their photo. If you’re looking to grow your fan base, use the Refer-a-Friend Template where you reward your followers for sharing the promotion with their friends. 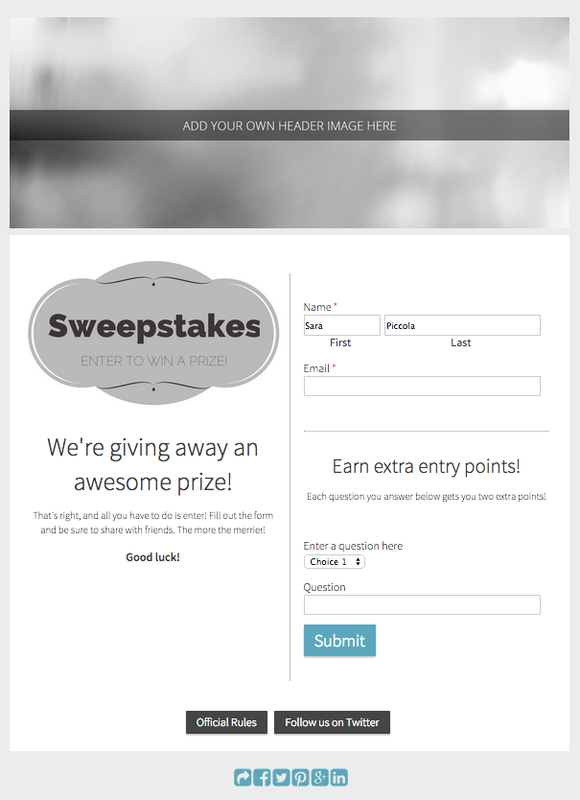 This template allows businesses to provide extra entry opportunities to followers who enter the contest and then get their friends to enter the contest as well. 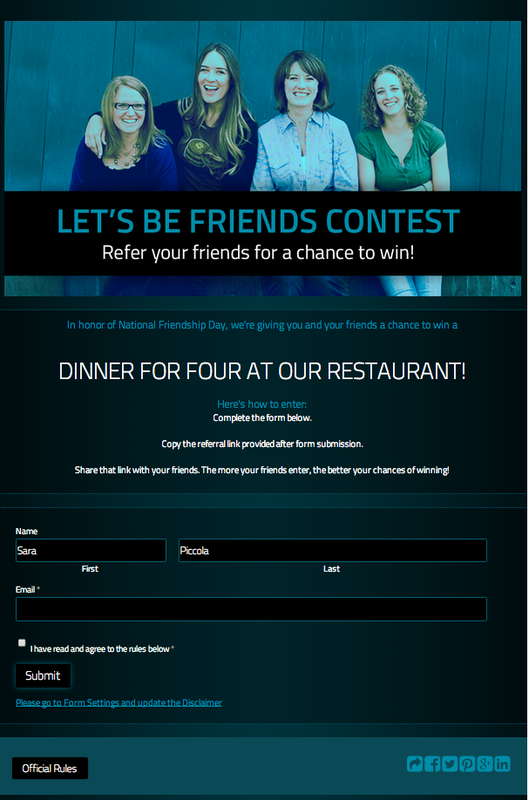 You can choose to reward your entrants between one and 1,000 extra points per friend who clicks on the shared link and enters the contest. With ShortStack, we make it easy for followers to share to Facebook, Pinterest, Twitter, LinkedIn and Google+. If you’ve been wanting to survey your followers but know they need a little motivation, try using the Extra Entry Points Survey Template. This template makes it easy for you to reward your followers for answering survey questions for a chance to win a prize. 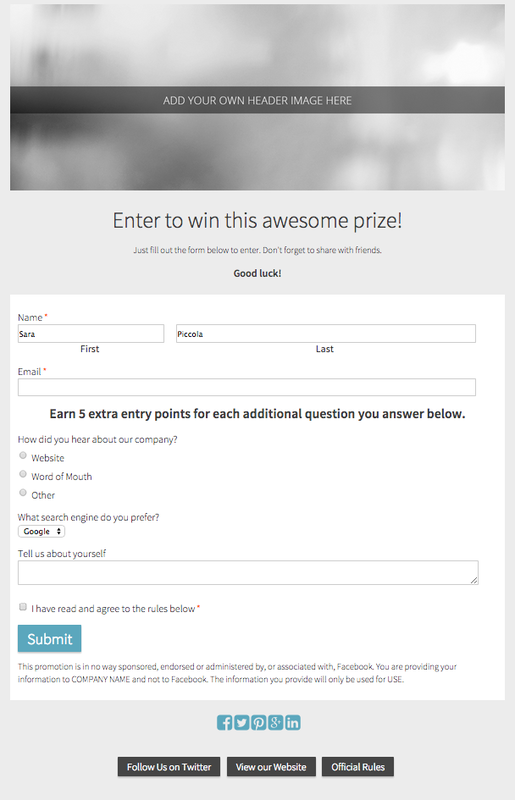 Try setting up your survey so that the more questions the entrants answer the more chances to win they receive. 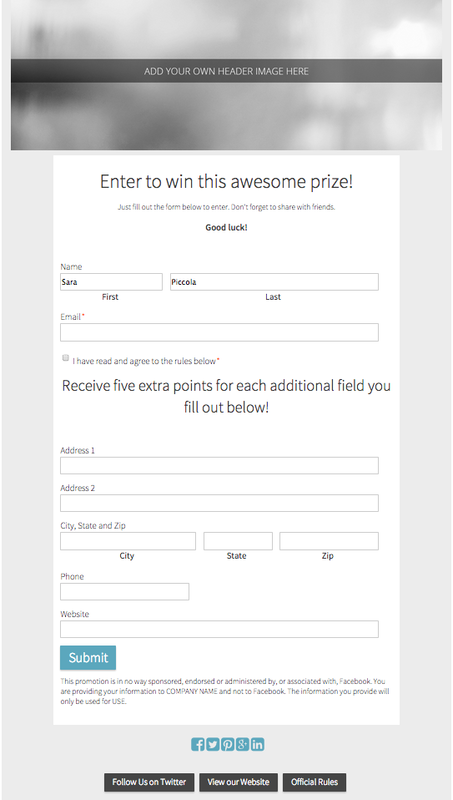 Similar to the previous template the Extra Points Sweepstakes Template is another way to collect information from your followers in exchange for entry into your sweepstakes. Maybe you own a restaurant and you want to know what night of the week is the best day for your followers to dine out. Or maybe you’re a realtor who wants to know what price range your followers are shopping in. This template can help you get the information you want. Use it template to offer an awesome, relevant prize and provide extra chances for your followers to win by answering some general questions you provide. A third way to use extra entries as motivation is to ask your followers to provide more information about themselves for additional chances to win your prize. The Extra Entry Points Template enables you to provide your followers with an easy way to earn extra entries by providing a small amount of information, like name and email. However, if they’re willing to tell more about themselves you can reward them for each additional form field –address, phone number, age, etc. — they fill out. Instagram continues to be the most popular image sharing platform on the web. If you’re looking to integrate Instagram with your Facebook or Web campaign, the Instagram Contest Template is the way to go. This template allows you to collect image entries straight from Instagram. Ask your fans to take a photo and post it to Instagram with the hashtag of your choice, connect your Instagram account to your campaign and entries will appear. Similar to our Instagram Contest Template, the Instagram Photo Vote Contest Template is another photo contest template but it adds a voting element. Once your fans have entered your promotion, they’re encouraged to vote on their favorite submission and get their friends to vote as well. 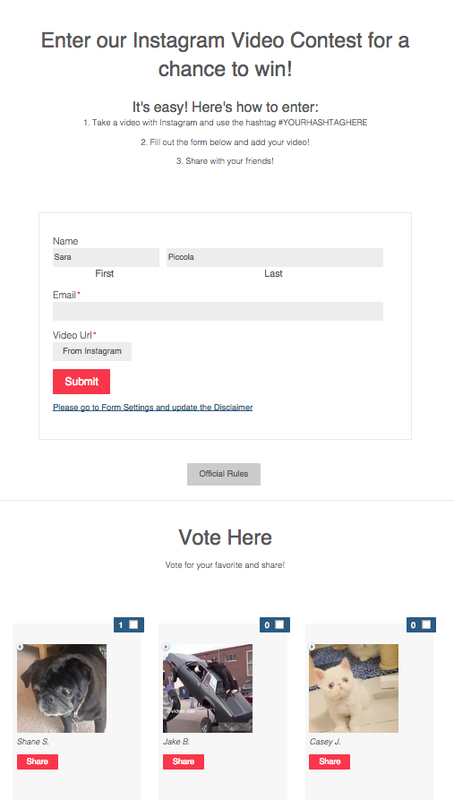 The Instagram Video Vote Contest Template works the same as the Instagram templates mentioned above, except it features videos instead of photos. Instagram videos are only 15 seconds in length so keep that in mind when asking your fans to participate in a video contest. Quizzes are a fun and easy way to produce engagement within your Campaigns. The Quiz Template allows you to offer a simple fill in the blank or multi-choice quiz to your fans in order for them to enter into a giveaway. If you’ve been wanting to get your fans’ opinions on a new product or offer, the Vote to Enter Sweepstakes Template is great for crowdsourcing. You can choose to upload your own content to be voted on or create a multi-level promotion where your followers upload the content and vote on it. Ready to start using one of these templates? Sign up for ShortStack for free! Dana Sullivan Kilroy is a communications professional with more than 20 years of experience delivering compelling content. Her work has appeared in national, award-winning publications and sites, including: The New York Times, The Los Angeles Times, The Wall Street Journal, USA Today, and Fast Company, Inc. Reach her on Twitter @dsullyk. Read more articles by Dana Kilroy.